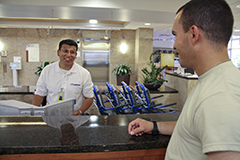 Patients and guests begin their hospital experience in the most positive way possible when welcomed by a friendly, knowledgeable greeter desk. From the first point of contact, HealthPark’s caring greeters immediately engage your patients and guests—setting a positive tone for the visit and helping the patient get to his or her destination on time, with ease. Your patients and their guests will appreciate these conveniences even more when combined with our concierge services. We continually empower our staff to go the extra mile to create a great patient and guest experience for our hospitals. Contact us to discuss how we may help you with your front desk experience.